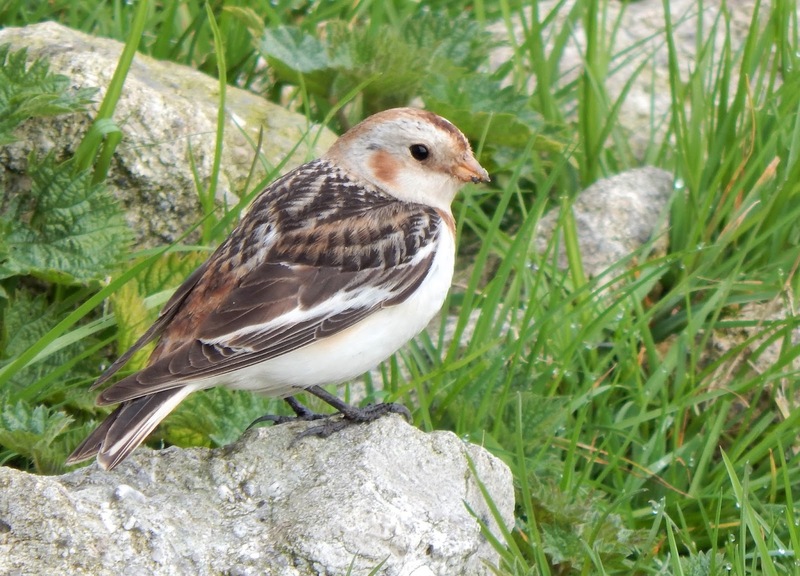 In his latest update, Lundy Warden Dean Jones reports: "Some super birds about the past few days on the island." Tuesday 10th April Very little was noted in the logbook for the 10th as the weather was a tad rubbish, with thick fog & mist dominating the day along with a few light downpours. A single Puffin at Jenny's Cove. One Snipe, flushed near Halfway Wall. One female Black Redstart in Barton Field. Blackcap: 23 in Millcombe Valley. The beautiful female Great-spotted Woodpecker again in Millcombe. Ring Ouzel: A very handsome male below Benjamin's Chair. 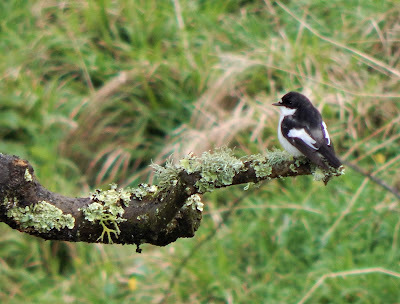 Pied Flycatcher: Two second calendar-year males in Millcombe Valley – see photo. And a lovely male Linnet in song outside Paradise Row. The female Great spotted Woodpecker was again seen feeding in Millcombe Wood. Treecreeper: Seen feeding in the trees below Brambles (P Bullock & J Cox). Cormorant: A single bird was noted in the logbook. Sand Martin: Three birds quartering over High Street field along with 12 Swallow. Collared Dove: 2 seen together in Millcombe in the morning and then later in the Village area. White Wagtail: A lone male feeding in Barton Field in the afternoon. Blackcap: 66 birds – most of which were recorded in the Millcombe area, including two in song. Chiffchaff: 15+ scattered throughout the south of the island. Grasshopper Warbler: The first of the year was reeling away behind the Secret Garden (lower Millcombe) first thing. Common Redstart: Four stunning males (Millcombe, Benjamin's Chair, Terrace & Barton Field) and a single female (Benjamin's Chair) – see photo below. 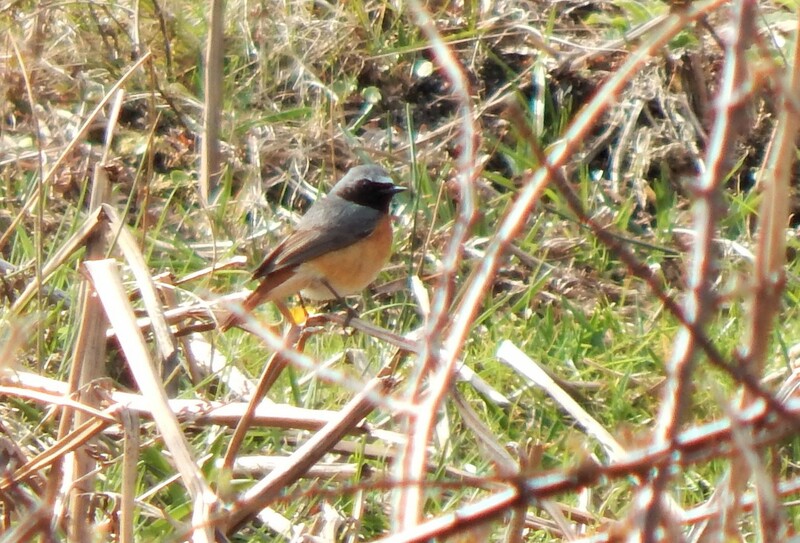 Stonechat: A male and female were seen together in South West Field, showing signs of possible breeding. The handsome male Ring Ouzel below Benjamin's Chair still. Song Thrush: Two birds outside Government House in the early morning. Linnet: 33 over South West Field in the early morning. Bullfinch: A lovely female seen and heard numerous times throughout Millcombe. Snow Bunting: A very bold and very beautiful female, seen initially by Peter Lambden, spent the morning feeding along the High Street track across from the pig pen (photo below). Friday 13th April A muggy day overall, lots of low-lying fog carpeting the island with intermittent spells of lovely sunshine. The lengthy periods of fog grounded quite a few migrants throughout the day which provided us with a super day's birding on the island! Teal: A single male and two females were on Pondsbury in the early morning. Oystercatcher: 33 birds around the island's coastline, including 10 roosting at Brazen Ward. Ringed Plover: A rather handsome male was feeding on a monster worm at the North End in the early morning. Snipe: Four flushed from the Pondsbury area. Woodpigeon: 7 from Millcombe and Quarter Wall Copse. Collared Dove: Two birds again in Millcombe Valley. Merlin: A single female bird looking for prey along the east coast in the early morning. Goldcrest: 25 birds scattered over the island. Skylark: 35, which included at least 29 territories spanning the plateau area. Sand Martin: A total of 14 were logged throughout the day. 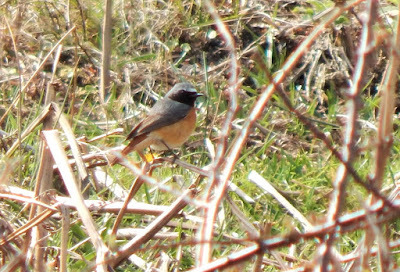 Whitethroat: The first bird of the year was seen perched on Threequarter Wall next to a Robin around mid-morning. Grasshopper Warbler: A single bird was heard reeling in Millcombe in the afternoon. Pied Flycatcher: Two seen on the Castle Parade wall. Redstart: At least four males and two females (Benjamin's Chair and the Terrace). Black Redstart: A male and a female at the top of Benjamin's Chair. Stonechat: Two males (one of which was singing its heart out in St John's Valley) and one female. Wheatear: 26+ birds – most of which were noted from the south west. Pied Wagtail: One on the ground and four other 'fly-overs'. Meadow Pipit: 119 scattered over the island. Linnet: A superb day of passage for this species with a total of 271 birds. Goldfinch: 30, which included a lovely little flock of 25 at South West Point. Snow Bunting: Seen along the High Street track again at 18:45 (E Angseesing & S Evans). Great-spotted Woodpecker: Still in Millcombe (P Bullock & J Cox). A predated Guillemot egg, complete with albumen (freshish), was found beneath one of the lighthouse track stones near the North End.